Yeshivat Har Etzion has long been known for excellence in Torah study. The yeshiva’s core curriculum is made up of traditional Talmud study, complemented by in-depth study of Tanakh, Halakhah and Jewish Philosophy. Yeshivat Har Etzion regards these complementary areas of study as a vital element in Torah education. They are the key to producing the kind of well-rounded, broad-minded Jews the world so desperately needs today – steeped in Torah, conversant in all areas of our tradition, yet able to fully engage with the modern world. 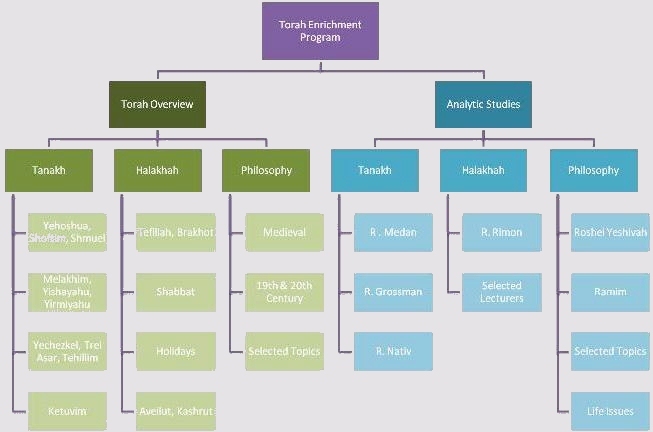 Revava, the newly-established Riva Koschitzky z"l Torah Enrichment Program, aims to incorporate non-Gemara study that takes place in the yeshiva into one over-arching, organized framework that will maximize the value of these studies. The restructured program will improve the quality of instruction and ensure that all Har Etzion students, whether from Israel or abroad, benefit from the fullest possible range of topics and lecturers. Just as important, it will serve as a befitting memorial to an inspiring individual whose commitment to broad-minded Torah for the modern world melds naturally with the values to which Har Etzion aspires. Click on the picture above to watch the event! in addition to our Roshei yeshiva and ramim. Wednesday and Thursday, Dec 13-14, 2017. Click hear for the complete program. Click here for pictures. AUDIO RECORDINGS OF CHANUKA STUDY DAYS: 5776, 5775, 5774, 5773, 5772, 5771. The Riva Koschitzky z"l Torah Enrichment Program is once again sponsoring this year's Chanuka Study Days. This year's topic is UBeHaalot Aharon Et HaNerot - The Legacy and Doctrine of Moreinu Harav Aharon Lichtenstein zt"l. Please join us on Wednesday and Thursday, Dec 9-10, 2014 (27-28 Kislev) at the yeshiva. The Study Days are dedicated in memory of Riva Koschitzky z"l, whose sixth yahrzeit falls on the 22nd of Kislev. Go to KESHET - our hebrew audio site - to hear recordings of this two day event. For program details. For pictures of the event, click here. For complete video coverage, click here. The Riva Koschitzky z"l Torah Enrichment Program is once again sponsoring this year's Chanuka Study Days. This year's topic is Al Gerei HaTzedek veAleinu: Conversion in our Times. Please join us on Wednesday and Thursday, Dec 17-18, 2014 (25-26 Kislev) at the yeshiva. The Study Days are dedicated in memory of Riva Koschitzky z"l, whose sixth yahrzeit falls on the 22nd of Kislev. Go to KESHET - our hebrew audio site - to hear recordings of this two day event. For program details. For pictures of the event, click here. The Riva Koschitzky z"l Torah Enrichment Program is once again sponsoring this year's Chanuka Study Days. This year's topic is Dor LeDor Yabia Omer: Studying the Legacy of Rishon LeTzion Harav Ovadya Yosef zt"l. Please join us on Wednesday and Thursday, Dec 4-5, 2013 (1-2 Tevet) at the yeshiva. The Study Days are dedicated in memory of Riva Koschitzky z"l, whose fifth yahrzeit falls on the 22nd of Kislev. Go to KESHET - our hebrew audio site - to hear recordings of this two day event. For program details. For pictures of the event, click here. The Riva Koschitzky z"l Torah Enrichment Program is once again sponsoring this year's Chanuka Study Days. This year's topic is the Israeli Judicial System and the Torah Judicial System - Can the Two Meet? Please join us on Tuesday and Wednesday, Dec 11-12, 2012 (27-28 Kislev) at the yeshiva. The Study Days are dedicated in memory of Riva Koschitzky z"l, whose fourth yahrzeit falls on the 22nd of Kislev. Go to KESHET - our hebrew audio site - to hear recordings of this two day event.For program details. The Riva Koschitzky z"l Torah Enrichment Program sponsored this year's Chanuka Study Days on the topic of Leadership and Vision, Wednesday and Thursday, Dec 21-22, 2011 (25-26 Kislev) at the yeshiva. The Study Days were dedicated in memory of Riva Koschitzky z"l, whose third yahrzeit fell on the 22nd of Kislev. Go to KESHET - our hebrew audio site - to hear recordings of this two day event. For program details. 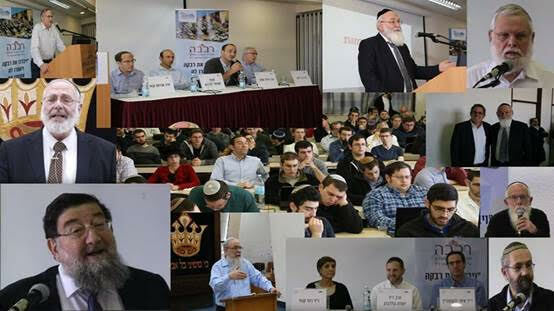 The Riva Koschitzky z"l Torah Enrichment Program sponsored this year's Chanuka Study Days on the topic of The Relationship between Jews and Non-Jews, Wednesday and Thursday, Dec 1-2, 2010 (24-25 Kislev) at the yeshiva. The Study Days were dedicated in memory of Riva Koschitzky z"l, whose second yahrzeit fell on the 22nd of Kislev. Go to KESHET - our hebrew audio site - to hear the Panel Discussions: "Ma'amad HaMi'utim BeMedinat Yisrael," and "Bein Chaviv Adam leChavivin Yisrael," as well as a report on the Israeli Delegation to Haiti, given by one of its participants. For program details. Special Tu Bishvat Lecture with Dr. Moshe Raanan - Did Chazal Understand Botany? The Riva Koschitzky z"l Torah Enrichment Program invited Yeshivat Har Etzion's bogrim to join our current talmidim and their fathers for an Erev Limud in the Beit Midrash, Gimel Nissan, April 7th 2011. The afternoon program included shiurim by Harav Aharon Lichtenstein, Harav Beni Lehman, Mr. Ari Shefer, Harav Yaakov Medan, and Rav Moshe Taragin. Complete program details. Recordings of the shiurim can be heard on KESHET - Har Etzion's hebrew audio site. Riva was born on August 19th, 1960, in Montreal, Canada to Joey and Annette Colton. Following her graduation from the Hebrew Academy of Montreal, she studied for a year at Michlalah-Jerusalem College in Bayit VeGan and continued on to Barnard College in New York where she graduated with a BA in Computer Science. Riva married Joel Koschitzky in 1981, and together they made aliyah from Toronto one year later. Riva lived in Israel for 27 years and died from breast cancer on December 19th, 2008. Riva is survived by her husband Joel and her three sons: Yedidia (Hesder machzor 37), Yekutiel (Hesder machzor 39), and Amitai.